The 2018 SYGNVS Conference in Covington, LA is ONE week away! This post summarizes the experts and training sessions in store for the 2018 SYGNVS Conference. This year, the agenda also includes a second day of post-conference training on tips and tricks. 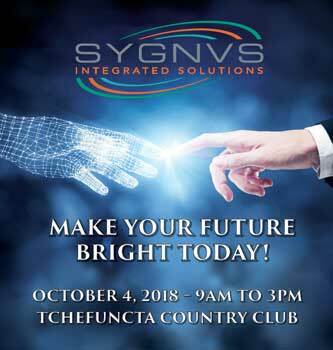 SYGNVS Integrated Solutions is bringing industry leaders, experts, and entrepreneurs together in Covington, LA for its 2018 SYGNVS Conference. The two-day conference will take place Thursday, October 4 and Friday, October 5 at the Tchefuncta Country Club. This year, attendees will not only reap the benefits of the conference itself on Thursday, but registration also includes a second post-conference training session on Friday! This year’s agenda offers another great suite of informative presentations and learning sessions that revolve around our company’s products: MIP Fund Accounting, Laserfiche ECM, and Sage 100 ERP (formerly MAS90 and MAS200). Experts from each of our partner companies will introduce innovations, explore applications, and teach new workflow tips to attendees. Dr. Tina Thomas will open the conference on Thursday with a keynote message, “Understanding the Latest and Greatest Human Technology!” Mark Perry of Barracuda will follow with an in-depth look at IT security intelligence. After a break for lunch, three expert presenters will introduce innovative user tips and tricks: John Woodward on Sage 100, Wes Dubay on MIP Fund Accounting, and Stanley Halim on Laserfiche. A presentation on process improvement by Chynna Reddix, Records Specialist at Alliance Safety Council, will close the conference.